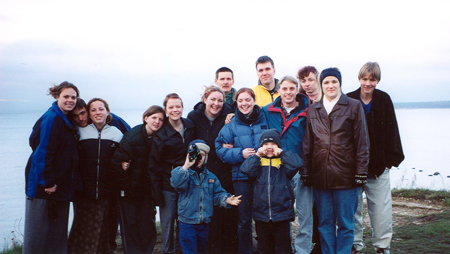 Our group with friends from Estonia, on the shores of the Baltic Sea. When I was nineteen I spent a semester living in Moscow, teaching English as a second language to ten year olds. While there we went on a trip where we visited Helsinki, Stockholm, and Tallinn, Estonia. And it’s at the port in Tallinn where this story begins. We had left Moscow a week earlier, sharing the news with a Russian LDS kid of our plans . . . well, that Russian kid knew a Finnish girl from Youth Conference, and her mother knew an Estonian woman via the internet, and that Estonian woman knew some “Mormons” – and those Mormons were sure to let us stay with them. Only trouble was, this was all hearsay when we loaded the ship to cross the Baltic sea from Stockholm to Tallinn. When we arrived at the port we weren’t really sure what was to happen, never having actually made contact with these supposed Mormons. We figured it was for us. Kristi, the teenage girl, had taken the day off school, and her father the day off work, because they didn’t know what time their “LDS friends” would arrive in port. All they knew was that we would come on Friday. They had been standing there all morning with their sign, watching as each ship came to port, waiting for us, their “LDS Friends” to arrive. Kristi was the only one in the family to speak English, and her father was the only one who could drive, so they were both imperative to getting us where we needed to be. Now, to appreciate this story you have to understand a little bit about the recent history of Estonia. It was a part of the former Soviet Union, and only gained complete independence in 1994, just five years prior to this trip. As part of the post-soviet landscape, the economy was particularly hard hit, and most Estonians struggled to provide basic necessities for their families. The Mormon father who met us at the dock provided for his family by using his van in running a taxi service. But he took the entire weekend off work that particular weekend to cart the ten of us Americans (okay, one British, and one Canuk was with us), around Tallinn for our touristy pleasure. He also called the entire branch and arranged for housing accommodations for all of us. But I was lucky, Lyndsi & I got to stay with this gentleman, his daughter (Kristi) and his entire family of nine children. Apparently generosity didn’t end at the American tourists. He and his wife had adopted two children from the local orphanages because they had severe health conditions (one needed a heart transplant!) and would otherwise die in the impoverished state run institutions. That night he, and the entire branch, took us all out to see “Bolshoy Pappa” — in America it’s called “Big Daddy.” To this day it’s the only Adam Sandler movie that I like, and it’s only because of my memories of this weekend. Anyway, he wouldn’t let us pay for our own tickets. Believe me, we tried. When was the last time you paid for ten extra people at the movie theater? The next day we needed to run some errands to the embassy and Russian embassy for visas and what not. Then he carted us around to all the beautiful and amazing sights the city had to offer. Tallinn really is the best kept secret in Europe in my opinion. It was such a beautiful city. Well, it turned out we chose the VERY BEST WEEKEND to visit Estonia, because that Sunday they were dedicating the very first chapel in all of the Baltic States! So that Saturday night there was an open house at the chapel and a dance. It was so much fun to spend an evening with the Saints and missionaries from all over Tallinn as they celebrated their new building. That night Kristi and her dad drove everyone home (oh yeah, Kristi’s dad also gave everyone rides to church each week – picking up branch members from all over the city because he was one of the few who owned his own vehicle). And then he took us home, but on our way he stopped at a gas station by the sea, and got us each hot dogs. Gas station hot dogs are the best, even in Estonia. So we sat by the sea, and watched the stars and ate hot dogs, and it might have been the best night ever. That afternoon we had to board our train back to Moscow. We set our bags out and gave hugs to our unbelievable hosts. Our Estonian mother gave Lyndsi and I a bag of food to share with the others on the train. In the bag was enough food to last the ten of us a week! As she gave us our final hugs she handed each of us a little glass jar. In it was her own home-grown honey from her own bees she kept behind her house. With tears in her eyes she told us that she hoped to someday be able to go to the temple, though she couldn’t imagine how. I couldn’t either, but I hoped. A year later or so President Hinkley announced that a temple would be built in Helsinki, and my heart flew with happiness. Helsinki was just a short boat trip across the sea and surely my Estonian mother would be able to go to the temple as she wished. These days life is very busy. Life is very full. Wyatt and I each comment at times that though we’ve had our own adventures in our youth, they dim in our memories in comparison the the adventures of today. But when ever I pull out a new bottle of honey, I always think of my Estonian family, of the sacrifices they made for me, a complete stranger. I think about how I will never be able to repay them. I think about how my testimony grew on the other side of the world where the gospel was new and young and tender. I think about the stars, shining over the Baltic, reflecting in the sea, and eating hot dogs with a family who would forever be in my heart. You can read all “Tales for Tuesdays” here. You’re right Michelle! I guess I forgot as I was rattling the story off last night (although I did have my journal out for fact checking, I guess I missed that part) 😉 But I remember you got sent back to Helsinki (or Stockholm?) and Amanda went with you, and you came back to Moscow with a copy of “The Little Prince” for me, which still sits on my bookshelf and I read to my little lovelies not too long ago. Ah, good memories. Pay it forward! Your story makes me cry. Why is it that those who have so little give the most? You are not only an artist with pictures, but an artist with words. Thank you for sharing. Beautifully written Andrea! Thanks for sharing. Wow, what an amazing trip!!! Great memories. I have forgotten a lot. That was a great time we had in Estonia. We all really need to swap memories of our great times there together to help remember, or at least help me remember. Look forward to your stories Andrea, great idea.